Telangana Polytechnic Admissions Application form 2018-18/PJTSAU Polytechnic Admissions 2018 /PJTSAU Agriculture polytechnic Diploma course admissions 2018: The Professor Jayashankar Telangana State Agricultural University (PJTSAU) has given the Agricultural Polytechnic Admission Notification 2018 on May 30, 2018 and the PJTSAU is inviting the applications in the prescribed proforma from the eligible candidates for admission into two year duration Agricultural, Seed Technology Polytechnic Diploma Courses and Three year Diploma in agriculture Engineering courses in Professor Jayashankar Telangana State Agricultural University (PJTSAU) and its affiliated recognized private Agriculture Polytechnic institutes for the academic year 2018-2019. Eligible candidates can apply through online mode only. The applicant should carefully read the prospectus before proceeding to apply online. He / She can either download a copy of the prospectus Click here to download or read it online. 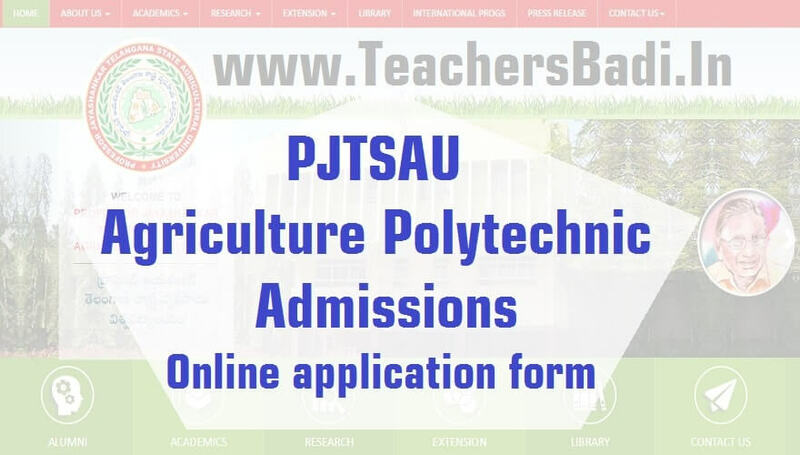 The applicant should read and understand all the instructions Click here to download and eligibility criteria for admission before proceeding to fill the online application form. The applicant is advised to take a print out of the instructions so that he/she can refer to the same while filling the form. Submission of false/fake documents will lead to summary rejection of the application. Payment of application fee: Rs.650/- (in case of SC/ST/PH candidates Rs.350/-). The applicant has to select Debit Card /Credit Card (Visa / Master Card)/NET banking/ Wallet option to pay the application fee and follow the online instruction to complete the payment of fee. A computer generated hard copy of the online application filled-in correctly and complete in all respects including payment of fee should be downloaded and sent through by Speed Post only so as to reach The Registrar, Administrative Office, Professor Jayashankar Telangana State Agricultural University, Rajendranagar, Hyderabad – 500 030 on or before 21-06-2018 at 4.00 PM. The University will not be responsible for any postal delay or loss of application during transit in this regard. The particulars furnished by the applicant in the application form is final and the candidates should therefore be very careful in uploading / submitting the application form online.